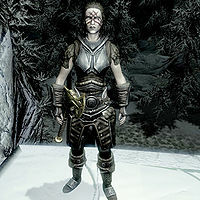 Eisa Blackthorn is a Nord bandit living in Skyrim. After a year in Cidhna Mine she became a member of the White River Gang, a group of bandits in White River Watch led by Hajvarr Iron-Hand. She and the others were forced to flee after a failed mutiny. Eisa went to Windhelm along with Ra'jirr where they heard about a group of treasure hunters near Morthal. After joining Kyr's band in Frostmere Crypt she was put in charge of the dig and soon after discovered an underground forest. In the forest they discovered a sword on some kind of monument, which Kyr kept for himself. After the sword had been removed Ra'jirr began hallucinating about the Pale Lady and decided to steal the sword and return it to the forest. Kyr assumed Eisa and Ra'jirr had stolen the sword together and put out a bounty of 100 gold for both of them. Eisa will be found being attacked by her fellow bandits outside Frostmere Crypt. You may assist her, but you will be able to acquire her related quest regardless of your actions. If she survives the encounter at the crypt, she will follow the road and end up at the Moorside Inn in Morthal. Healing her along the way will be taken as an act of aggression and cause her to attack. Eisa wears a full set of steel armor, including a pair of steel gauntlets (two variants), and a pair of steel boots (two variants). She is equipped with a leveled war axe (up to elven quality) and a leveled shield (up to steel quality). She carries a leveled potion of restore health, a 25% chance of a lockpick, and a small amount of gold. Bandits may not attack her and the quest will not start. To fix this, pickpocket and read her journal. You can also fix this by jumping down from the path above Frostmere Crypt. She may become permanently aggressive toward you upon entry to the Moorside Inn. Since she attacks first, you can slay her in self defense (and not get a bounty), then loot her journal and read it to trigger the quest. ? If you kill her outside of Frostmere Crypt, then bring her inside as a dead thrall, she might blink out of existence shortly after entering. ?